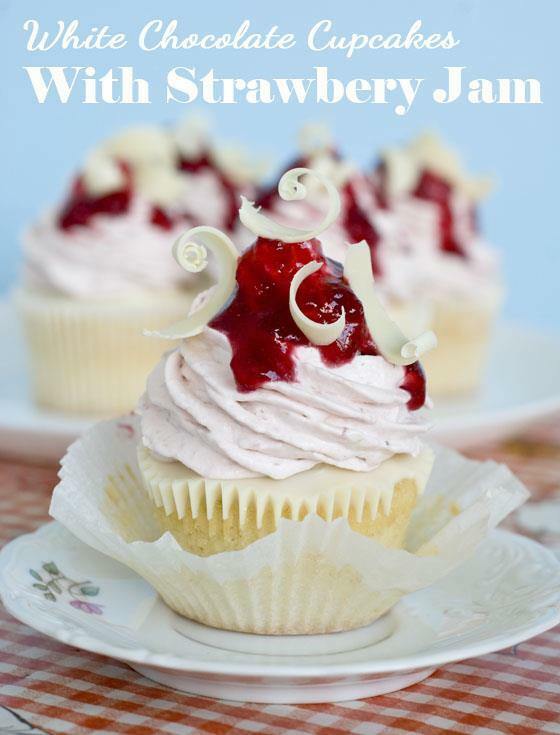 White Chocolate Strawberry Cupcakes are moist and dense vanilla cupcakes with strawberry filling, topped with a layer of melted white chocolate and strawberry-white chocolate cream cheese frosting. For the past few days as I browsed the Internet hoping to find the inspiration for my new culinary adventures, I came across many recipes for pumpkin and apple treats. I know, the autumn has arrived and that Halloween is approaching; nevertheless I decided to take a step back and recall the summer days by posting a recipe for a light and refreshing dessert. Hmmm, but what kind of a dessert would it be? Of course, what would said summer more than the refreshing strawberry flavor! Enough with chocolate desserts that my household members fancy. It’s time to satisfy my own cravings! I’ll start with vanilla and it is going to be a true summer dessert made in the midst of grim autumn. Preheat the oven to 350 degrees F, and line your cupcake pans with your liners. In lightly beaten eggs add wet ingredients (oil, milk, vanilla extract) and mix well. Add dry ingredients and mix until it’s evenly combine. Fill the cupcake liners about 2/3 full. Let the cupcakes to cool completely. 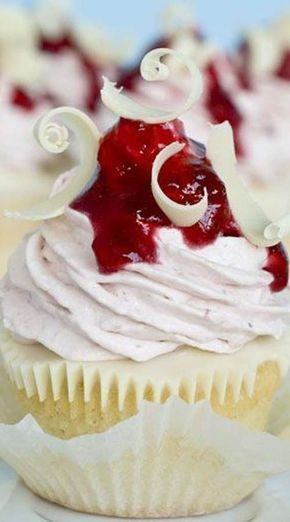 Whit the sharp knife cut the cone and fill the cupcakes with strawberry jam(1-2 teaspoon of strawberry jam per cupcakes) cut the tops and place them back onto filled cupcakes. Melt white chocolate and spread with the spoon over the cupcakes. To make the frosting, melt white chocolate over a double boiler and set aside to cool. Beat heavy whipping cream until soft peaks form, add powdered sugar and vanilla and continue mixing on high speed until stiff peaks form, mix in strawberry jam and set aside. Beat cream cheese until fluffy then add it to heavy cream, mix until smooth, then gradually add cooled melted white chocolate and mix until combined. Frost the cupcakes and store in the fridge. Before serving drizzle cupcakes with the mixture of strawberry sauce and jam and garnish with white chocolate shavings. 0 Response to "White Chocolate Strawberry Cupcakes"